His race in the Fountain of Youth Stakes at Gulfstream last month was a beautiful performance, but it was his race in an optional claimer on January 26 that made me a true believer. The figure came back slow for that race, but he had a rather eventful trip. Running over the speed friendly strip at Gulfstream Park going a mile and an eighth, Orb checked briefly entering the clubhouse turn and proceeded to close willingly into a race that lacked much, if any, pace. Regardless of the level, it takes a gifted horse to be able to close the way he did at a track like Gulfstream Park. Another positive for Orb is the fact that his trainer happens to be Hall of Famer Shug McGaughey. Rarely does Shug have young three-year olds on the Kentucky Derby trail, and when he does, they end up being pretty decent horses…Easy Goer ring a bell? Now I’m not about to say Orb is destined to be on par with Easy Goer, but it’s definitely a vote of confidence that McGaughey has proceeded with Orb the way that he has. With the bloodlines of A.P. Indy and Unbridled in his direct family, I’m confident Orb will excel as the distances get further. 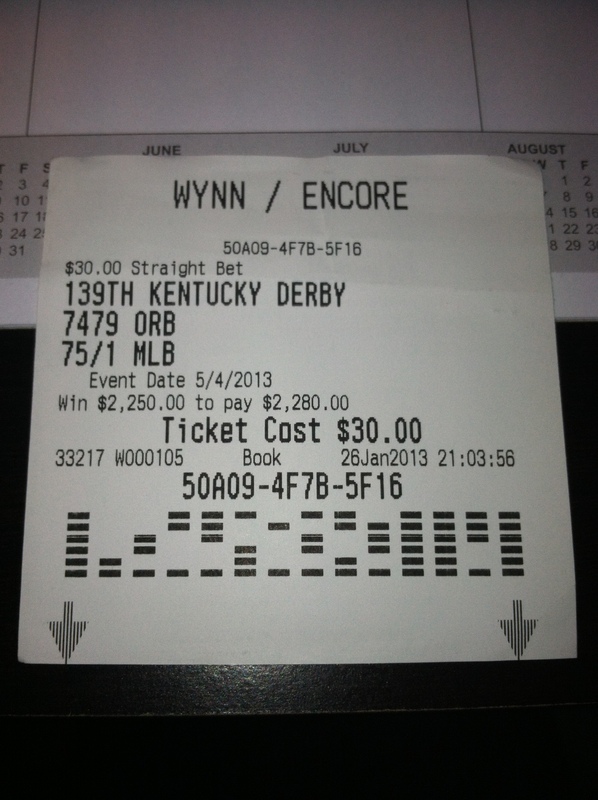 Fingers crossed, Orb will give me my I’ll Have Another, 2.0 in 2013 and takes down the Run for the Roses. Hear the Ghost took advantage of a strong pace set up front in the San Felipe Stakes this past weekend, but there is no denying that he finished incredibly strongly. The biggest positive I’ve drawn from his victory is that this was his first time going a route of ground and going two turns – you’d have to think he’s only going to move forward off this effort. Jerry Hollendorfer definitely knows how to keep a horse on the improve, and being by Ghostzapper and out of a Coronado’s Quest mare, the added distance should be beneficial to Hear the Ghost. A small sample size, but I think Hear the Ghost is the strongest three-year old competitor on the West Coast at the moment. Speaking of the San Felipe, Flashback was one of the entrants involved in the hot pace on the front end, which understandably fell apart with a sixteenth of a mile to go. I would have loved to have seen him rate and sit just off Goldencents in the San Felipe, but he was incredibly head strong and pulled Julien Leparoux all the way around the track. By the time the real running started, Flashback was running on empty. I’m going to attribute his inability to rate to inexperience, as he’s only raced three times in his young career. The Santa Anita Derby will speak volumes about this son of Tapit – if he can relax in the early and middle stages of the race, I think he’s a serious player in the Kentucky Derby picture…if he pulls the rider directly to the front and battles it out with the other speeds, I’ll take this as a trend and more likely than not eliminate him from my list of Derby contenders. We haven’t seen Power Broker since a fifth place finish in the 2012 Breeders’ Cup Juvenile, but I think he has an immense amount of talent. He’s had a few nagging injuries that have kept him out of action to date in 2013, and that’s becoming a bit of an issue if he’s going to make the Kentucky Derby in seven weeks. I can’t take him off the list just yet, because he is training and preparing for a return to the races – but he’s running out of time, and running out of time fast. We should know in the next week or so if Bob Baffert is going to send him out in the Santa Anita Derby, Wood Memorial, etc. The current individual favorite for the Kentucky Derby, Verrazano has the racing world abuzz following his facile victory in the Tampa Bay Derby this past weekend – an effort after which rider John Velazquez said the horse “didn’t like the track”. Eeeesh…I understand it appears as though he didn’t beat much, but what does it say about the ability he possess if he destroyed a field in a graded stakes race in which he didn’t really handle the track? There’s no denying he’s looked like a monster in his brief three race career, but I still have this nagging feeling that he’s got some distance limitations. He’s brilliant at a mile and probably nine furlongs, but I’m not sold on the idea that he wants to go ten furlongs. Add that he’ll be among a host of animals that want to be on the lead, and that could spell disaster for Verrazano at a short price in Louisville. I very much like the breeding of Super Ninety Nine, but I have a real issue with him at this point – his huge victory to date came over a sloppy surface. Kentucky is known for some rain in early spring, so if the track comes up as “off”, he’s got a huge chance. Until he proves to me that he can take care of business as authoritatively as he did at Oaklawn in the Southwest last month on a fast dirt track, I’m going to hold back on singing the praise of this son of Pulpit. I still can’t get over the amount of trouble Revolutionary got into in the Withers and still somehow came out of that race victorious. I like to see young horses overcome some adversity and be able to prevail – but I look at Revolutionary’s race in the Withers as a negative. He did overcome a year’s worth of trouble, and he was probably half an hour the best…but that’s just my problem – I don’t think he beat any horses of significance in the Withers. Once he faces a saltier group, I think Revolutionary will be exposed as being a cut below the rest of the serious Derby contenders. I have him listed on my Top Ten mainly because he has a strong stamina pedigree, but I’ve got some major question marks about just how good this horse is. I’m very anxious to see how he runs in his final Derby prep. Palace Malice is another lightly raced colt that I expect to take a step forward in his next race, most likely the Louisiana Derby. As a whole, I thought the Risen Star Stakes was a poor race, but I thought Palace Malice ran respectably considering the way he was handled. I surely thought he’d be closer to the pace early on and be allowed to get first run on the closers, but he was taken further back into the pack and forced to fight with the late runners. I expect him to be closer to the lead in his start. Vyjack is a hot name amongst the horse community at the moment. He’s undefeated, and more importantly has shown the ability to win on the lead as well as closing from deep in the pack. I sound like a broken record at this point, but I’m withholding judgement on Vyjack until he faces a stronger cast of characters. The races at Aqueduct thus far have left me a little underwhelmed – that should change when the Wood is run. Time will tell, but Vyjack has shown a versatility that shouldn’t go unnoticed.